The lifetime prevalence of mental health disorders has been estimated to be between 18.1% and 36.1% globally and 10.6% in India., The Indian joint family system and close family values have its own uniqueness with a multilayered hierarchical support system. The burden of mental illness globally accounts for 32.4% of the years lived with disability and 13.0% of disability-adjusted life years., Quality of life is an individual's perception of his/her position in life in the context of the culture and value systems he/she live and in relation to his/her goals, expectations, standards, and concepts. Various studies have compared caregiver (CG) burden with schizophrenia and affective disorders.,,, Caregiver burden with alcohol use disorders has also been studied but not as extensively as schizophrenia and affective disorders, and it has not been compared to other psychiatric disorders in the same study too. In this background, our study aimed to compare CG burden among schizophrenia, affective disorders, and alcohol use disorders in the same study setting across four domains of quality of life along with the various clinical and sociodemographic factors affecting burden as well as quality of life. This is a cross-sectional study conducted for 1 month. The study was conducted at the Department of Psychiatry of Pushpagiri Institute of Medical Sciences, Thiruvalla, a tertiary care postgraduate teaching hospital in Central Kerala, India. Eighty participants (twenty from each group) who gave the informed consent were included from CGs of patients with schizophrenia, bipolar affective disorder, alcohol use disorders, and depressive disorder based on the Diagnostic and Statistical Manual of Mental-5 criteria both from inpatient and outpatient sections taken through consecutive sampling. For an assumed correlation coefficient of 0.7 between Burden Assessment Schedule (BAS) and World Health Organization Quality of Life-BREF (WHOQOL-BREF), the needed size was 13 in each group, in spite of which twenty participants were included in each group. Primary caregivers were the ones residing with the patient and nonprimary if they were responsible for the patient but not staying together. CGs who gave informed consent, who were not suffering from any serious mental illness or substance use disorders, and those above the age of 18 were included in the study. Caregivers taking care of more than one person with mental illness were excluded from the study. Hamilton Depression Rating Scale for depressive disorders. After getting ethics committee approval, the CGs meeting inclusion criteria were assessed using a structured questionnaire following which we used the BAS of SCARF and WHOQOL-BREF scale. IBM Statistical Package for Social Sciences (IBM SPSS Statistics for Windows, Version 20.0. Armonk, NY: IBM Corp.) software. Data analysis included statistical tests such as analysis of variance (ANOVA), t-test, Chi-square test, Mann–Whitney U-test, Kruskal–Wallis test, and measures of central tendency (mean and standard deviation [SD]) wherever appropriate. Post hoc analysis was done for WHOQOL-BREF scale. Mean age of the study group was 49.26 ± 15.92 years (mean ± SD). Nearly 63.2% of the CGs were females, 61.3% of CGs had middle school certificate, 51.3% were unemployed, 73.8% of the CGs were from rural area, and 57.5% belonged to APL. Most of the CGs were primary CG (92.5%) and most were parent (37.5%) followed by spouse (36.3%) and then children (13.8%) [Table 1]. Nearly 53.8% of the CGs were inpatients. Nearly 72.5% of the CGs were under caregiving process for ≥5-year duration, 46.3% of the CGs suffered from physical comorbidities. Among them, 19% had diabetes mellitus and 12% had hypertension. 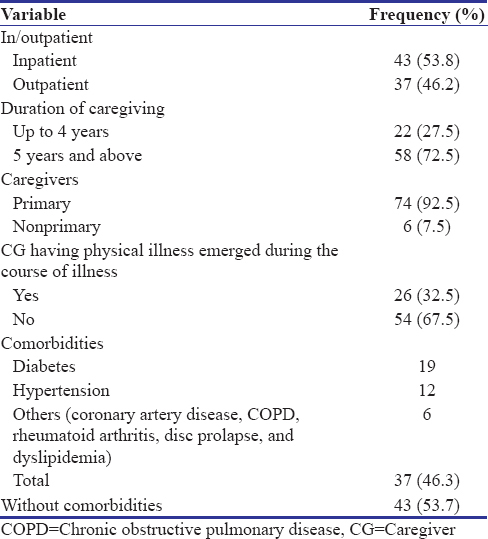 Around 32.5% of the CGs developed physical comorbidity during the caregiving process [Table 2]. BAS scores obtained significance using Kruskal–Wallis test. BAS score in CGs of schizophrenia scored highest (40.65 ± 11.38) and depressive disorders scored the least compared to other groups [Table 3]. Burden was highest for fathers of patients (48 ± 10.55) following wife of patients (38 ± 13.09) [Table 4]. 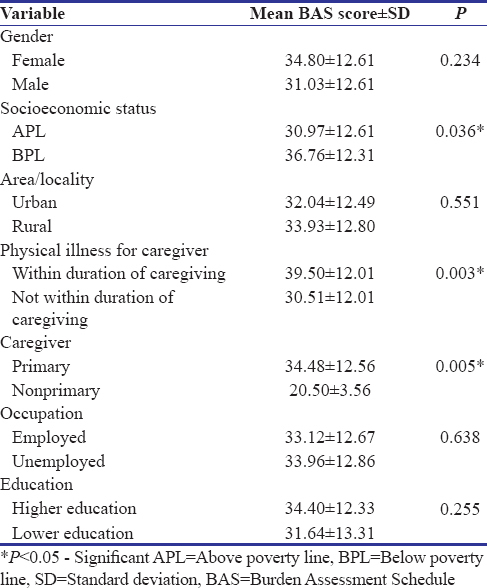 Burden was significantly higher for CGs who were from rural area (P = 0.036), when they get physical illness during caregiving process (P = 0.003), and for primary CGs (P = 0.005) [Table 5]. There was a significant positive correlation between AUDIT, YMRS, and BPRS scores (which measured the severity of illness of patient) with BAS score [Table 6]. 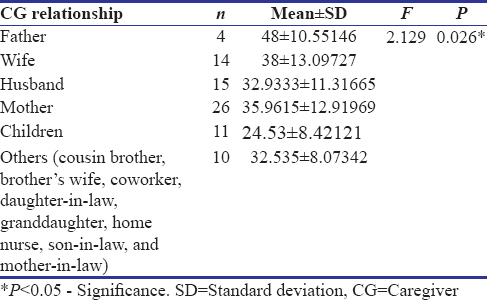 WHOQOL score between different groups of CGs and within each group was significantly different in all domains using ANOVA test and the maximum difference was observed in domain 4, i.e., environment domain (F = 6.124; P = 0.001) [Table 7]. BAS score was significantly negatively correlated to all domains of WHOQOL-BREF (P < 0.001) [Table 8]. The profile of the current study consisted of CGs who were mostly above 50 years, which constituted about 43.75%. Although most of them had middle school certificate, majority were unemployed and coming from rural area. Unemployment could be due to the burden of caregiving process that they were not able to go for job which indirectly reflects a good caregiving. The CGs were mostly primary CGs so that the patients were given good caring. Majority of the CGs had been under caregiving process for more than 5 years, and the main physical comorbidities were diabetes mellitus and hypertension. We also assessed whether these comorbidities increased during caregiving process and found it was only 32.5%. BAS score was significantly (P < 0.001) high in CGs of schizophrenia compared to other groups followed by bipolar disorder, alcohol dependence, and depressive disorder with least burden. The previous comparative cross-sectional study also showed greater CG burden for schizophrenia followed by bipolar disorder and mental retardation. Fathers as CGs had more burden; however, their representation was poor. This may be due to the fact that they may be the earning person for the family. We could find that there was a significant CG burden for those who were BPL. This may be due to unemployment and financial difficulties that had an impact on the areas to care for both the patient (e.g., purchasing medications) and themselves. In the previous studies,, there was a significant burden for CGs coming from rural areas. Burden was also significantly greater for primary CGs as they may be exposed to the worsening of symptoms of the patient and patient difficulties in taking care of themselves. Those CGs with physical comorbidity aroused during caregiving process had a significantly greater burden which might have influenced the caregiving process. In all groups of CGs, the impact on well-being is most affected and marital relationship is least affected on BAS scale. It was found that as the severity of schizophrenia, alcohol use disorders, and bipolar disorders increases, the CG burden also increases significantly except for depressive disorder severity. This may be due to good intermorbid level of depressive disorder patients. There were significant differences in all domains of quality of life of CGs. In the previous study, there was only significant difference in the psychological health and social relationships. In our study, the CGs were having physical pain and sleep disturbances in the physical domain. This may be due to higher age and physical comorbidities of CGs. In the psychological domain, most of them were complaining of poor concentration and negative feelings associated with stigma. In the social relationships' domain, most were complaining of poor social support from relatives. 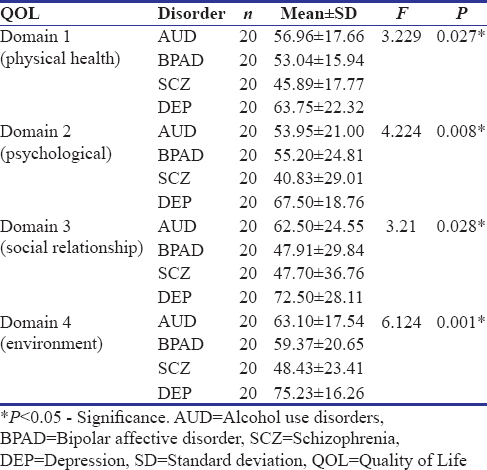 In post hoc analysis, it was found that in the environment domain there was significantly low quality of life for CGs of schizophrenic patients than CGs of alcohol use disorders (47.70 vs. 62.50, P = 0.028) as well as low quality of life for CGs of bipolar affective disorder patients than CGs of depressive disorders (47.91 vs. 72.50, P = 0.028). This may be due to poor financial resources, lack of time for acquiring new information, and skills and opportunities for recreation/leisure for CGs of schizophrenia and bipolar disorder group. CGs with higher burden had significantly reduced quality of life in the study which has been reflected in other studies too. In India, there is hardly few studies on burden assessment and quality of life among CGs of more than two different psychiatric groups. In this study, the severity of psychiatric illness was assessed and correlated with CG burden. BAS, developed and standardized in an Indian community and therefore more suitable for this study, was used which is widely accepted for measuring burden. The study could assess the variables affecting CG burden. More than 90% of CGs were primary which might have improved the quality of assessment. The study could find out the domain differences between groups with respect to quality of life. There are many limitations in this study. The study was of cross-sectional nature with a small sample size and thus may not be generalized to the community. BPRS is a scale which is not specific to schizophrenia, and hence Positive and Negative Syndrome Scale would have been a better substitute. The study was not matched for age and gender and hence may have confounding factors. Understanding CG burden is very much essential for holistic care of patients. Caregiving is very much difficult for schizophrenic patients than for patients with any other major disorders such as bipolar disorder, alcohol use disorders, or depressive disorders. The study could imply that CGs coming from BPL should be given much more importance and it will be beneficial if special privileges are given for them to reduce the burden, for example, financial privilege and employment scheme. The physical comorbidity suffered by CGs greatly impacts the caregiving process, and thus their quality of life is reduced. CGs' concerns over domains such as poor concentration, negative feelings, stigma, poor social support, poor financial resources, and lack of time for leisure should be addressed and may be given appropriate counseling sessions either singly or through family clinics. Coping skills can be imparted to improve the quality of life. Future researches with large sample size and longitudinal follow-up would better help in assessing the magnitude of CG burden. Thus, we should work hard to narrow the gap between what needs to be done and what is actually being done and between the burden of psychiatric disorders and the resources being used to address this problem. Thus, reducing the burden can increase the quality of life. The authors would like to thank Dr. Arati Suseelan, who encouraged and supported them throughout the study. Vigo D, Thornicroft G, Atun R. Estimating the true global burden of mental illness. Lancet Psychiatry 2016;3:171-8. WHOQOL Group. Position paper from the World Health Organization. Soc Sci Med 1995;41:1403-9. 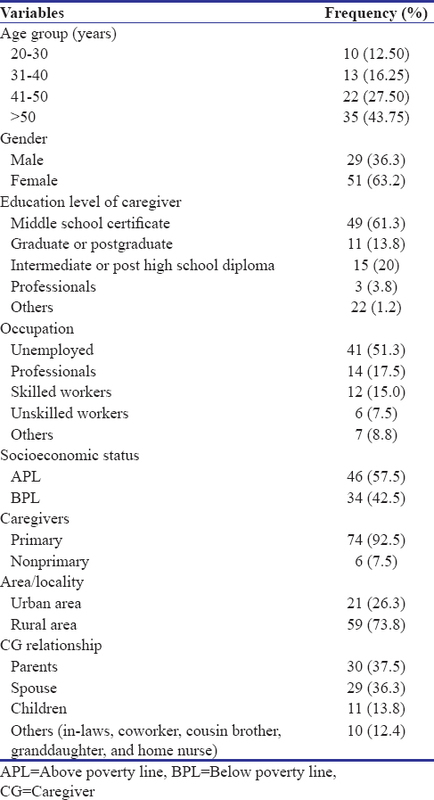 Narasipuram S, Kasimahanti S. Quality of life and perception of burden among caregivers of persons with mental illness. AP J Psychol Med 2012;13:99-103. Moily S, Murthy RS, Nagarajaiah B, Sekar K, Puttamma M, Kumar KV, Hiremath SB. Burden in families with schizophrenic patients in a rural community. Indian J Psychiatry 1997;39:48. Ogilvie AD, Morant N, Goodwin GM. The burden on informal caregivers of people with bipolar disorder. Bipolar Disord 2005;7 Suppl 1:25-32. Dalky HF, Qandil AM, Natour AS, Janet MC. Quality of life, stigma and burden perception among family caregivers and patients with psychiatric illnesses in Jordan. Community Ment Health J 2017;53:266-74. Vaishnavi R, Karthik MS, Balakrishnan R, Sathianathan R. Caregiver burden in alcohol dependence syndrome. J Addict 2017;2017:8934712. Sell H, Thara R, Padmavati R, Kumar S. The Burden Assessment Schedule (BAS). New Delhi: World Health Organization, Regional Office for South-East Asia; 1998. p. 13-20. World Health Organisation Quality of Life (WHOQOL) Group. Development of the World Health Organization WHO-QOL Bref quality of life assessment. Psychol Med 1998;28:551-8. Sreedevi A, Cherkil S, Kuttikattu DS, Kamalamma L, Oldenburg B. Validation of WHOQOL-BREF in malayalam and determinants of quality of life among people with type 2 diabetes in Kerala, India. Asia Pac J Public Health 2016;28:62S-9S. Chadda RK, Singh TB, Ganguly KK. Caregiver burden and coping: A prospective study of relationship between burden and coping in caregivers of patients with schizophrenia and bipolar affective disorder. Soc Psychiatry Psychiatric Epidemiol 2007;42:923-30.